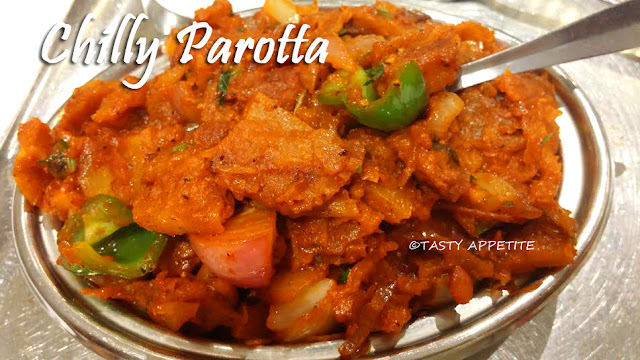 Chilly Parotta or Kothu Parotta is a lipsmacking delicacy of South Indian cuisine. 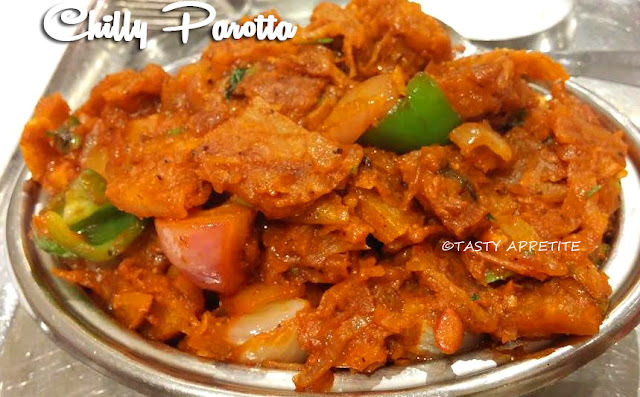 It tastes spicy hot with shredded parotta sautéed in onions, tomatoes and aromatic masala. This popular street food recipe is very easy to prepare at home in no time. Parottas can be prepared at home or you can get frozen parottas from the shop. Try this restaurant style chilly parotta recipe and enjoy your dinner..! 1. Heat 1 tsp of oil in dosa pan or fry pan. 2. Add the parotta and toast it until it turns soft. 3. Allow to cool and cut it into squares using kitchen squares. 4. Set the parathas warm in hot pack. 5. Slice onions, garlic, green chilly, capsicum, tomato, coriander leaves and spring onions. 6. Heat oil in a frypan. 7. Add onions and fry them into transculent. 8. Add curry leaves, garlic and green chilly slices. 10. Add ginger garlic paste and cook for a minute. 11. Add the capsicum slices and spring onions. 13. Add finely sliced tomatoes and cook until its mushy. 14. Now add the turmeric pwd, kashmiri red chilly pwd, cumin pwd, coriander pwd, garam masala pwd, salt and tomato ketchup. 16. Add ½ cup of water and allow the masala to boil. 17. Simmer the flame for 4 to 5 mins. 18. Once the masala turns thick consistency, add the chopped parotta pieces. 20. Toss it gently with a fork. 21. Cook in low flame for 2 to 3 minutes. 23. Squeeze few drops of lemon juice. 24. Sprinkle freshly chopped coriander leaves. 25. Transfer to serving bowl. 26. 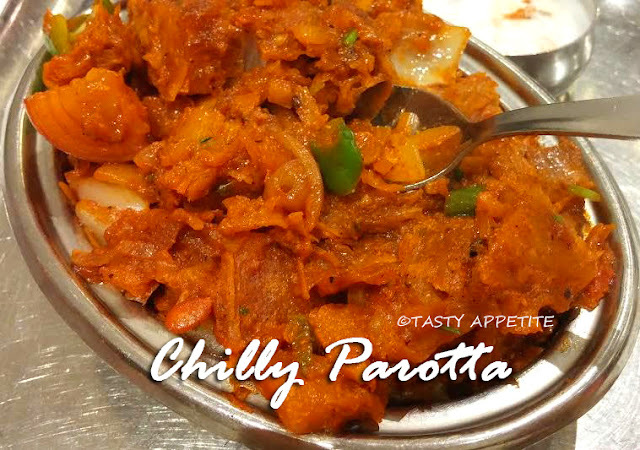 Lipsmacking delicious Chilly Parotta is ready to serve. 27. Enjoy hot with onion raitha.